This Document Describes the differences between various models of Instrument Clusters fitted to the EF/EL/NF/NL/DF/DL Series Falcons. It also has information on Upgrading an Instrument Cluster, modifications that need to be made, wiring information, swapping odometer readings, and some points to watch out for when performing these upgrades. With the Advent of the EL, all these clusters were revised to give a cleaner look, with Orange Needles, Less "Tick Lines" on the Speedo and Tacho, and a new Fuel Door Release Indicator. A new Cluster was also added to the range, which was fitted to the XR (Tickford) series of Vehicles. This new cluster is exactly the same as the Fairmont Mid Series Cluster, with the exception of a Tickford Logo being placed on the Tacho Section. NOTE : If fitting Fairmont/Fairmont Ghia Instrument Cluster to a GLi/Futura/XR Model, it will be necessary to add a Resistor to the Instrument Cluster Circuit Board, in order for the LCD Backlighting to function correctly. A Big thankyou goes out to WAYNE for Discovering this Interesting Quirk with the EL Clusters, and for working out how to fix this problem ! Spot Lamps Indicator (there, but not wired up). In addition to these features, the Mid Series Cluster has the following Features that are common with the Base Series Cluster. The EF Chaser (Police) Series Cluster is a special issue cluster, and was made only available to Police issue EF Falcons. The Chaser (police) Cluster is based on the Mid Series Instrument Cluster, but with 2 very important modifications made to it. Instead of a Diagnostic Mode that is available with all other EF series Clusters, the EF Police Cluster has a Speedo Calibration Feature, which allows the user to calibrate the Speedo, and Odometer Readings with a percentage error. These Clusters are very rare, and a re a much sought after item because of this calibration feature, as it makes wheel, tyre, and Diff Changes very easy in regards to calibrating the Speedo. The NF Fairlane, and DF LTD Instrument Clusters (High Series) are very similar in layout, to the EF Series of Clusters, but unfortunately, very few parts are interchangeable between the two. These clusters feature Unique Background Lettering / Graphics, Needles, Bulb Holders, LCD Panel, and Warning Lamps. With exception to the NF Fairlane cluster, and fitting Fairmont Clusters to GLi/Futura/XR models, it is possible to change between different Cluster models rather painlessly. The Low, Mid and Police Clusters all use the same connectors, same Bulb holders, same needles, and very similar circuit boards / Needle Assemblies. NOTE : Fairmont, Fairmont Ghia, and EL-GT Clusters are missing 1 Resistor, that is used to allow LCD Illumination, with the Park Lamps on ! When fitting an EF/EL Fairmont, EF/EL Fairmont Ghia, or ELGT Instrument Cluster to an EF/EL GLi/Futura/XR model Falcon, you will Need to add this resistor for the LCD Panels to function correctly. Information for fitting this resistor (and the reasons behind it - are outlined below. 3. If Upgrading from a Base Instrument Cluster, The Oil Pressure Switch will need to be replaced with an Oil Pressure sensor. 4. If adding the Low Coolant Warning Lamp on Gli Vehicles, an extra wire, and a Coolant Sensor switch will need to be added. (Note All Clusters have the ability to display the Low Coolant Output). 5. If adding the Low Windscreen Washer Level Warning Lamp, a new Washer Bottle, with Level sensor, and an extra line will need to be added for the Warning to work. (Note All Clusters have the ability to display the Low Windscreen washer Level LCD Warning). 1. There is no difference with V8 and I6 Tacho sections ! - Don’t ask me why, but I definitely have a V8 Fairlane Cluster fitted to my EF, and it has an Inline 6 motor. The Tacho section on both the original, and Fairlane Clusters are within 20RPM tolerance of each other, throughout the entire rev range ! 2. The Odometer Readings can be swapped, changed or kept. The Odometer Reading is held within the Instrument Cluster, not within the EEC-V Engine Management, nor does the Instrument Cluster have a Backup Memory, or a Tamper-proof mechanism to deter Odometer Fraud ! 3. There is no Electrical, or Calibration Difference within the Speedo sections of the cluster, in terms of different Factory fitted Diffs, wheel, and Tyre Ratios. Changing Clusters will not alter the Factory Speedo readings. A Big thankyou goes out to WAYNE for Discovering this Interesting Quirk with the Fairmont Clusters, and for working out how to fix this problem ! NOTE : When fitting a Fairmont/Fairmont Ghia/EL-GT Instrument Cluster to a GLi/Futura/XR Model, you will need to add 1 Resistor to the Instrument Cluster, in order for the LCD Panels to Illuminate correctly. Without this resistor, the LCD Panel(s) (Clock/Trip Computer/Climate Control/Odometer) will not Illuminate when the Park Lamps, or Headlamps have been switched on. The reason for fitting this resistor is Fairmont/Fairmont Ghia/EL-GT/Fairlane/LTD Model Falcons use the Body Electronics Module to Dim the LCD Panels, when the Headlamps are switched On. The Low and Mid Series Body Electronics Modules DO NOT HAVE THIS FACILITY. Fords Method of getting around this problem, was to fit a Resistor the Instrument Clusters for use in GLi/Futura/XR Models. This Resistor Feeds the Negative LCD Dimming Circuit, when the Park Lamps are on, and without it, the LCD Illumination Bulbs will not Illuminate. Please Note : Fitting this resistor does not apply when fitting an XR Cluster, to a GLi/Futura/XR Model Falcon. Finally, it is also worth noting that if fitting a GLi/Futura/XR clusters to a Fairmont/Fairmont Ghia/EL-GT, THIS RESISTOR WILL NEED TO BE REMOVED, and IN ORDER FOR THE Variable Dimming Function to work correctly with the LCD Panels. The location of this resistor is on the Instrument Circuit Board, and is located to the right of the RHS Instrument Cluster Connector. I.E. You will need to remove the Dials, and the circuit Board, flip the circuit board over, and solder the resistor in the position shown below. The Resistor you will require is a 1Watt, 47 Ohm Resistor. The Colour Bands for this resistor are Yellow, Violet, Black, Gold (5% Tolerance, 4 Band type). Or for a 5 Band 1% Tolerance type resistor , the colour bands would be Yellow, Violet, Black, Black, Brown. Please note though, you will Require a 1Watt type Resistor, due to the currents required by the LCD Panels. The following are Catalogue Numbers for the above resistors, from various Electronics stores. To do this, you will obviously need to remove the Instrument Cluster, and Disassemble. 2.Unclip the Black Plastic Lens Holder by unclipping the 2 clips at the top, and 3 clips at the bottom of the cluster. 4.Remove the 2 Torx Screws, Located at the back of the Instrument Cluster (Near the Bulb Holders). These screws are used to hold the Dial Faces in place. 5.Once these screws have been removed, gently ply the Dial faces away from their respective metal clips. This requires some force to do this, but it is important that you pull the faces directly up and away from the circuit board ! Do not try and Wiggle the faces away from the board. 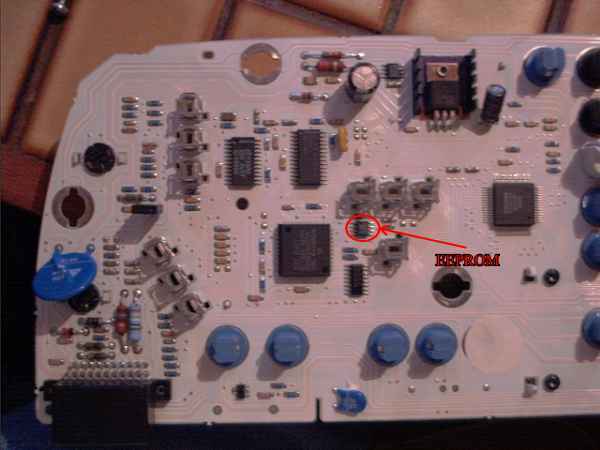 6.To remove the Cluster Circuit Board, Remove the 2 Torx screws located At the bottom of the Circuit Board. 7.Finally, lift the circuit board from the top, up, and out of the Cluster casing. (Pulling the bottom electrical connectors out from the Casing housing). Once the location is found, Heat up the Solder points outlined above, with a soldering iron, and attempt to clean the area of the solder. Below the solder are mounting holes for the resistor. Removing the Excess Solder will allow the resistor to be mounted by placing its legs through these holes. Once fitted, solder in place, and re-assemble the Instrument Cluster, and test. An E2PROM is an Electrically Erasable, Electrically Programable, Read Only Memory, very similar to the Flash upgradeable Computer Bios. This chip is located approximately 1cm to the right of the chunkiest chip, on the back of the Instrument Cluster Circuit Board. This is the same position as per the Low, Mid, and High Series Instrument Clusters. This is a small, delicate, and heat sensitive chip, and as such, is very susceptible to permanent damage, which WILL if damaged, render the instrument cluster USELESS ! If a Mid or High series Instrument cluster is used with an Oil Pressure switch, the Oil Pressure gauge will either show 0 Oil Pressure, or very very High Oil Pressure, with no intermediate pressure. Obviously, this variable voltage is required for an Oil Pressure gauge. This is a worthwhile modification that can be made to the EF and EL Series model Falcons, as it is relatively inexpensive to do, and it can be added to ALL Instrument clusters, (low, Mid, and High Series). Considering the number of cases of Head Gasket Problems with the EF and EL, this modification could save you a lot of money ! The only models that do not have the low Coolant Sensor are Unfortunately, the GLi models. The Low Coolant Sensor is integrated in to the Plastic coolant Bottle, but can be added to an existing coolant bottle. The part you will require is 10K888-AA, the low coolant level sensor. This part simply screws in to the existing Coolant Overflow Bottle, but you will need to remove the blanking plug first. One wire is Black, and is connected directly to ground. 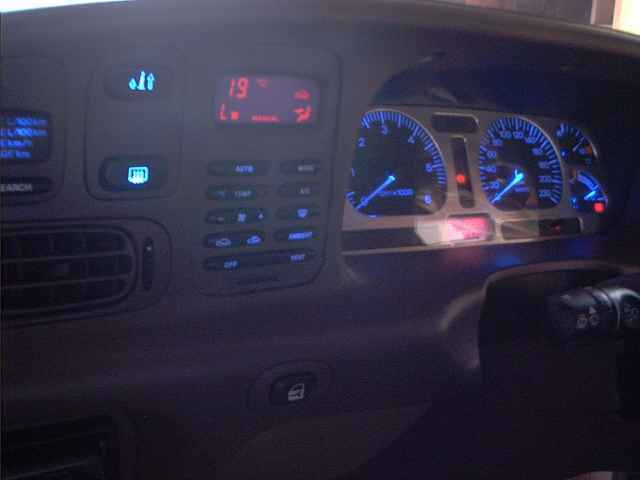 The other wire colour, Yellow/Red, should be connected directly to the Instrument Cluster, low coolant lamp, On the Right Hand Side connector, Pin Number 3. Finally, you will need to add the Low coolant sensor Bulb to the Instrument Cluster. This Bulb is located right next to the LCD Panel, on the Right Hand Side (With the Back of the Instrument Cluster facing towards you). The socket for this bulb may be blanked out by a round paper sticker, simply remove this sticker, and fit a new Bulb and Bulb Holder. The EF and EL series Instrument Clusters have the facility for a Fog/Spot/Driving Lamp Warning lamp, just above the Smartlock Warning Jewel, on the Instrument Cluster. Although the Facility is there, there are some additions that you will need to make to the Instrument Cluster, in order for this function to work. Firstly, a wire must be run to Pin 8, of the Left Hand Side (Passenger Side) Instrument Cluster. This wire Needs to have +12Volts running to it, in order for the Spot Lamp Warning Jewel to Illuminate. With most aftermarket Spot/Fog/Driving Lamp Circuits being triggered by switching +12V to the Spot Lamp circuit, this should not be a difficult task. Once this has been completed, you will need to add an extra Bulb, and Bulb Holder to the Instrument Cluster. There is a blanked out socket, just above the Smartlock LED. This socket is blanked out using a round paper sticker, and can easily be removed by simply peeling it off the circuit board. Once this sticker is removed, you will need to fit a Bulb Holder, complete with a Bulb to this empty socket. It is recommended that a 1.2Watt Globe is fitted to the Bulb Holder, though this is not terribly important (An increased Bulb Wattage will do no damage to the Cluster), you may find that at night time, 2Watt Bulbs may be too bright, and annoying. If you have an EF Model Instrument Cluster, then this is all that is required. And you are now ready to test the Spot/Fog/Driving Lamp warning jewels operation. Unfortunately, EL Model Instrument Clusters are a slightly different matter. These clusters are missing 1 Diode that is VITALLY important for the Spot Lamp Warning Jewel operation. For this circuit to function correctly, you will need to add 1 x 1N4004 Signal Diode to the circuit board, roughly behind the Battery Voltage Gauge. See the picture below for more details. 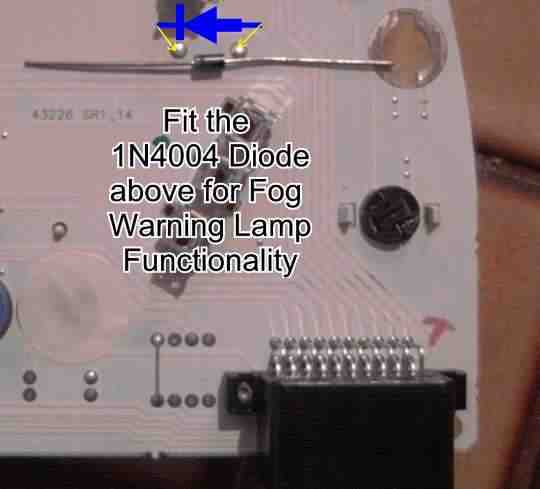 Once this has been completed, you will need to locate the position that the 1N4004 Diode will need to be soldered in place. The following image will assist you in this process. Once the location is found, Heat up the Solder points with a soldering iron, and attempt to clean the area of the solder. Below the solder are mounting holes for the Diode. Removing the Excess Solder will allow the Diode to be mounted by placing its legs through these holes. The Diode ! MUST ! sit in the direction where the Silver Band (the Cathode end) is towards the center of the circuit board. This is VITALLY IMPORTANT, as fitting the diode in the wrong direction will mean that the circuit will not Function AT ALL. The Low Windscreen Washer Fluid Sensor detects when the level of the Windscreen washer fluid falls to a level that allows only a few more seconds of Windscreen washer operation. The Warning lamp is integrated within the LCD Odometer panel, on the EF and EL Series Falcons, and surprisingly enough, it is actually available on all clusters. Unfortunately, if you have a GLi Model, without ABS, then you will not have the electrical connector, and wiring already available. EF/EL Futura Models, and GLi Models with ABS fitted will have this connector already fitted, and wired up, so all that is needed is to add the Low Washer Fluid Switch, which is part of the Windscreen washer Bottle. The Windscreen washer Level sensor is a simple On Off switch, and is integrated within the Washer Bottle, using a rubber grommet. The sensor can be removed and fitted, but you would probably find that it is easier to simply purchase a new/used Bottle with the sensor already fitted, from a Fairmont, Fairlane or LTD. The electrical connector is a Female T piece, and is exactly the same type as used on the Front Turn signals. (See below for Wiring Information, in regards to the Right Hand Side Instrument Cluster Connector). As mentioned above, when the Windscreen washer level drops to a low level, this switch conducts, causing the Pink/Yellow wire going to the Cluster to be grounded. The Instrument Cluster will then Illuminate the Warning segment, on the LCD Panel. This Connector is used for the Brake and Park Lamps Bulb out warning.